Focus is huge for me this year. I want to focus on many specific things for my family, my advocacy work, my blog, my business, and more. However, before I am able to do any of this, I want to continue to focus on me. When I feel better about myself and my actions, everything else goes more smoothly. As you get older, you realize that if you continue to push yourself to the back of the priority list, everything else will suffer along the way. I am still learning to make me, myself, and I a part of the list (no less the top of the list), so I admit I am not expert. There is definitely a learning curve with bumps along the way. Over the last year, I have tried to help myself to achieve less stress and not overreact about everything that crops up in life. This is HARD for someone that likes to be in control and has a Type A personality. With help from friends reminding me to breathe, I have learned to step back, wait a few minutes, collect my thoughts, and then respond. This has been huge when it works. In addition to this, I have seen that when I make others smile and happy it makes me feel better. Something I learned in 2014 that I hope to carry over this year is the need to give thanks. It is not simply acceptable just to say a quick thanks, or acknowledge someone on Thanksgiving. We must work on letting others know when they do something amazing, are extra nice to you, or help you to stop a crisis from happening. Too many times, we are quick to use the phone to call to complain to an individual when we are upset. This day and age, email communications make it almost instantaneous even if nobody is around to answer the phone. Of course, this often means emotions are running high and word choices may not be the best. I admit it, I am guilty of this just like most people. Playing defense is hard, especially when you are wearing your parenting hat. The mama bear in me immediately comes out and I can feel my blood pressure rising. It feels like a personal attack and it is too easy to fire off something in which the tone may not be interpreted properly. My suggestion, hold back for a while and think about making someone else feel better in that moment. Use that pent up energy and emotion to let another individual know why they matter and how they have helped you, your business, your family, or something else. — If your child comes home from school happy, email their teacher to let them know how excited they were to learn about X, Y, and Z. Let go of differences you have about curriculum, testing, and anything else. Think of the teacher working with kids all day. Give them a nod so they know you are aware of what is happening and how happy your child is. — Contact your local municipality to let them know if someone went out of their way and helped you. 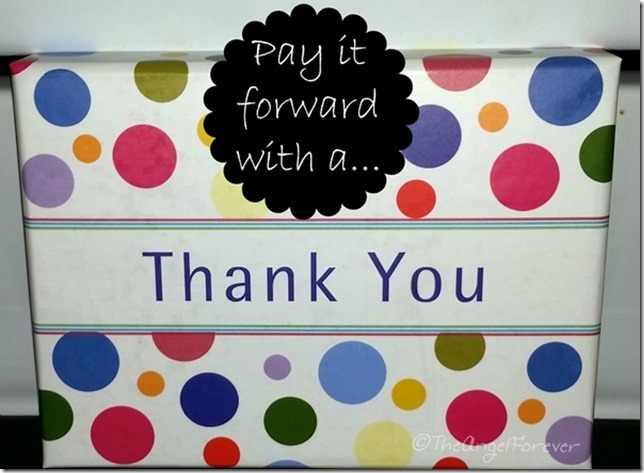 Get names and pay it forward. — Give the crossing guard that is there every day in the extreme cold getting the kids safely around traffic a note and small gift card for some hot chocolate or coffee. — When you see someone having a rough day, reach out to them. Let them know you are there. Follow up with an email or text the next day to see how they are doing and let them know you are thinking of them. — Bring in a special treat to someone that has been especially helpful recently. Let them know it did not go unnoticed and that you are glad that they were there for you that time. — As a parent of a child with an IEP, it is easy to be critical of the system. When things click and go well for your child, send encouraging notes to teachers, staff, CSE members, the superintendent, and School Board members. They need to know about the positive items taking place. This has been a huge focus of mine since September. The transition for my son to middle school went very well thanks to all of those involved. 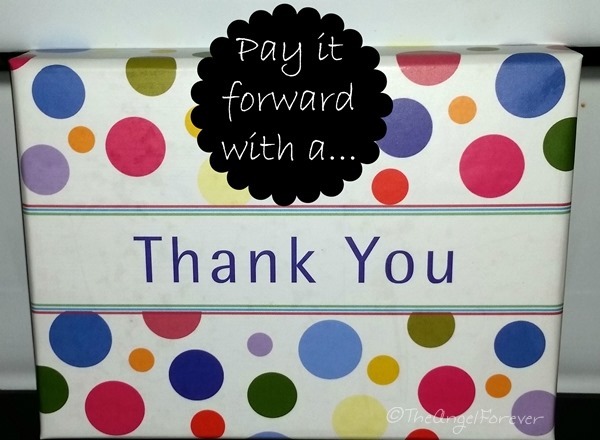 Now it’s your turn, how will you pay it forward with a thank you? Please keep me posted because it also makes me smile to know that others are participating in similar ways. This is such a great idea! I love surprising people when they least expect it and saying Thank You is a great opportunity to do just that. I brought flowers to my son’s preschool teacher today at pick up – just because! Love this. And I totally DO it. I bring the bus driver coffee when we end up on the bus in the morning. She keeps my kiddo safe and there’s no greater responsibility than that on many days. Andrea B.´s last blog post ..Shop NOVICA and support artists across the globe. I love these ideas. We are making teacher gifts for Valentine’s Day and I’m now adding the crossing guard to our list. I love this message! Thank you for sharing. I’m probably where you were last January, I am trying to ease up on my control and type a crazy moments and really pause and think before acting. Great timing for this message!